SHEBOYGAN FALLS, Wis. - ArmsUp Motorsports is in the final stages of preparation for the 2008 racing season. Excitement is high after a successful 2007 season which saw the ArmsUp squad claim a fourth place finish in the Formula Continental class at the SCCA National Championships. Over the winter break ArmsUp Motorsports added two new drivers to its FC contingent with John and Revere Greist coming on-board. The Sheboygan Falls team also completed restoration on Walter Vollrath's beautiful 1978 Lola 497 C Sports Racer. The father-son duo of John and Revere Greist join the team after a long and successful run in the Skip Barber Racing Series. Revere, the younger of the Greists, claimed three Skip Barber Regional Championships and backed those up with two runner-up finishes in the competitive series. Not to be out done by his son, John won an amazing 13 Grand Masters and 11 Masters Championships in his time in the Skip Barber Series. 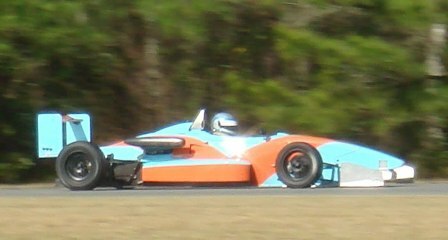 The Greists recently spent three days testing their all new Zetec powered Van Diemen Formula Continentals at Roebling Road in Savannah, Ga. The test was extremely successful with Revere lapping within three hundredths of a second of the Roebling Road FC lap record in his first time at the track. With brand new cars the test was virtually trouble free with one notable exception when John scooped up a fire ant nest into the car after a small off. The ArmsUp crew was able to clean out the car with only minor bites and John's testing program resumed. After two years of restoration Walter Vollrath's vintage Lola 497 C Sports Racer will make its debut in 2008. The car which was in found in a barn has undergone a complete ground up rebuild. Vollrath will campaign the Lola at the Road America Vintage races including the extremely popular Kohler International Challenge. ArmsUp Motorsports will shakedown the Lola in early April before Vollrath makes his race debut in mid May. The Kohler International Challenge will not be the only new event on the ArmsUp calendar. ArmsUp Motorsports will enter select races in the F2000 Championship Series. After increasing in popularity over the last few years, the F2000 Series will debut at Road America where ArmsUp expects to enter at least four of its six Formula Continentals. ArmsUp Motorsports is no stranger to pro racing. The team has posted solid runs in the Champ Car Atlantic Championship and two podium finishes in the Cooper Tires FF2000 Championship Series. Also new for 2008 is a completely revamped www.ArmsUpMotorsports.com. The site created by G.O. Designs features a completely new layout for fans of ArmsUp Motorsports. With everything new that is happening for ArmsUp Motorsports, a lot of the same will take place in 08 as well. Every driver from the team is returning from last year. In the Formula Continental class John Dickmann, Kirk Kindsfater, Jim Victor and Walter Vollrath will all be back behind the wheel of their ArmsUp prepared Van Diemens. And J.M. Paredes will carry the flag for the team once again in the Formula Atlantic class. Team owner Gregg Borland is excited for the new season, "This year is going to be a lot of fun. With the John and Revere (Greist) coming on, our new Vintage program and returning to Pro Racing, we have a few new challenges ahead of us. Even with the new challenges I am confident we can really build on our successes of last season with all of our drivers and have a great 2008." ArmsUp Motorsports first race of 2008 will be March 29 - 30 at Gateway International Raceway in St. Louis Mo. Jim Victor is scheduled to start his 2008 campaign behind the wheel of his familiar number seven Van Diemen. Revere Greist puts his new Van Diemen through its paces at a recent test in Savannah, Ga.